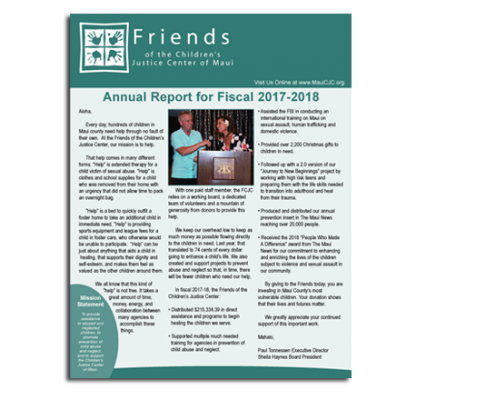 Click to view Annual Report The Friends of the Children's Justice Center of Maui publishes their 2017-18 Annual Report. 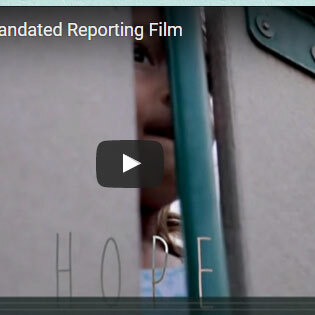 Due to the recent changes in the State of Hawaii's chapter 350 law surrounding mandated reporting laws for child abuse and or neglect, the Friends of the Children's Justice Center of Maui is proud to announce the release of our 2014 Mandated Reporting film. View the details regarding the new law in the Mandated Reporting Law Brochure. Friends of the Children's Justice Center of Maui is with Yuki Lei Sugimura and 2 others. Friends of the Children's Justice Center of Maui shared a post. Unfortunately more often than not people will silently carry the trauma of sexual assault around with them for a lifetime. Mahalo Mayor Victorino for breaking your silence during April's "Prevent Child Abuse Month". 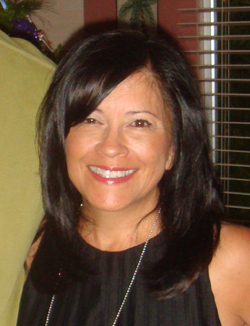 It is never to late to begin the healing process from childhood sexual assault and abuse. © Copyright - Friends of the Children's Justice Center of Maui. All Rights Reserved.